The benefits of Ethernet in vehicles are obvious: significantly higher data rates can be achieved at a comparable cost. This opens up new possibilities for designing innovative features and applications such as driver assistance systems. Automotive Ethernet will also be used as the backbone of future network architecture in the vehicle. BroadR-Reach technology, which was first specified by the OPEN Alliance (www.opensig.org) and adopted as IEEE specification (IEEE 802.3bw) in November 2015, has prevailed. The new 100BASE-T1 Ethernet standard will become a key element for constantly growing requirements for reliable data transmission in modern vehicles. Automotive Ethernet permits bidirectional communications at a data rate of 100 Mbps over a single unshielded twisted pair. As compared with 100BASE-Tx Ethernet with four shielded twisted pairs, 100BASE-T1 Ethernet makes it possible to significantly reduce the costs and weight associated with cabling in the vehicle while maintaining the same data rate. The complex transmission technology results in increased test requirements to ensure the proper functioning of the interfaces and in particular the interoperability of components used. Therefore, the OPEN Alliance has defined special compliance tests (Table 1) that have also been adopted by IEEE. The transmitter distortion test checks for correct data transmission with a maximum error of 15 mV. In the 100BASE-T1 test specification, the algorithms for signal analysis are defined as a MATLAB script. The algorithms require that the source of interference and the data acquisition be synchronized with the DUT clock. Looking at the specified test setup (Fig. 2), it becomes obvious that the ECU clock must be made available and used as a reference for both the oscilloscope and the connected signal generator in order to ensure a correct measurement. Fig. 2: The setup for tests that use an interference source (transmitter distortion tests) requires clock synchronization between the DUT and the test equipment. The clock of the 100BASE-T1 interface is 66.67 MHz. Test equipment such as signal generators and oscilloscopes usually allows clock synchronization based on 10 MHz reference signals. Rohde & Schwarz has developed the R&SRT-ZF3 frequency downconverter specifically for 100BASE-T1 compliance tests. It downconverts the 66.67 MHz clock of the 100BASE-T1 transmitter to a 10 MHz clock signal that can be used as the reference. This provides the user with reliable results that fully comply with the test specification. Some manufacturers require a test solution that works without the ECU’s clock. Rohde & Schwarz provides a solution for the ECU’s development that compensates for the deviations of the 100BASE-T1 interface’s clock. Thus, the transmitter distortion test can be performed either in line with IEEE test specifications or according to the requirements of automobile manufacturers without the clock being available. Signal levels of just a few millivolts often decide whether a compliance test is passed or failed. This is why oscilloscopes must deliver accurate compliance test results. For this reason, Rohde & Schwarz now provides high definition (HD) mode for compliance tests. This mode increases the vertical resolution of the R&SRTO oscilloscopes to up to 16 bit. To achieve this higher resolution, the signal is lowpass-filtered after the A/D converter. 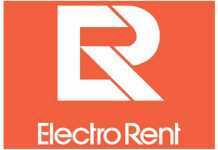 The filter reduces the noise, thereby increasing the signal-to-noise ratio. Users can flexibly adjust the bandwidth of the lowpass filter. The lower the filter bandwidth, the higher the resolution. 100BASE-T1 signals use a transmission frequency of 33.33 MHz. The signal is displayed unchanged if the filter bandwidth is at least five times the transmission frequency and therefore at least 166 MHz. Switching on high definition mode can achieve a resolution of 13 bit for 100BASE-T1 compliance tests by limiting the measurement bandwidth of the oscilloscope to 200 MHz. Additionally, irrelevant interference signals with higher frequency are attenuated. These high-frequency interference signals can have a negative influence on the compliance test, since the bandwidth of the oscilloscope used is clearly higher than necessary. Thanks to the low-noise frontend and the highly accurate single-core A/D converter, R&SRTO oscilloscopes have an excellent dynamic range and measurement accuracy (Fig. 3). Fig. 3: The following figure illustrates the signal differences with and without use of the high definition (HD) mode based on the eye diagram. The compliance tests that were defined by the OPEN Alliance and adopted by IEEE allow verification of 100BASE-T1 interfaces based on standardized test sequences. They should ensure, for example, that the components from various manufacturers can work together in the vehicle. The IEEE 802.3bw test specifications describe comprehensive transmitter signal quality tests for 100BASE-T1. Feedback from automobile manufacturers has revealed that compared with previous compliance testing, two additional test cases must be performed. Vehicle electronics suppliers now require the testing of seven test cases. The first additional test is the transmitter’s MDI common-mode emission. The second test involves the MDI mode conversion from the differential signal to common mode. Developers need to perform 100BASE-T1 Ethernet compliance tests on components or devices as part of ECU development or when debugging their designs during integration. For analysis and verification, there are all-in-one solutions such as the R&SRTO-K24 software option from Rohde & Schwarz with appropriate test accessories such as the Ethernet test fixture, which makes it simple to connect the oscilloscope probes to the DUT’s signal lines. As a special feature, Rohde & Schwarz offers a frequency downconverter (Fig. 4) that allows clock synchronization between DUT and test setup. This clock synchronization is described as mandatory in the 100BASE-T1 test specification for conducting a test. Fig. 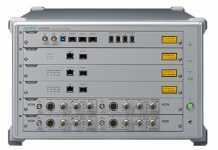 4: The R&S RT-ZF3 frequency downconverter allows clock synchronization between DUT and test setup. Based on the R&SRTO oscilloscope, the R&SRT-ZF2 test fixture set, the R&SRT-ZF3 frequency downconverter and the options R&SRTO-K24 for 10/100/1000BASE-T and R&SRTO-K23 for 10GBASE-T, Rohde & Schwarz is now offering a complete solution for compliance testing of the most popular Ethernet protocols. Dr. Ernst Flemming is product manager for oscilloscopes at Rohde & Schwarz in Munich. He studied physics in Tübingen (Germany) and Hamilton (Ontario, Canada) and earned a doctorate at the University of Kaiserslautern in Germany. The schedule for ECU development keeps getting tighter, so tests required by automobile manufacturers must be performed quickly. Easy-to-operate test software such as R&S ScopeSuite with its high level of automation can make a huge difference. Users especially appreciate the integrated test wizard in the Rohde & Schwarz solution, which guides the user through the setup in easy-to-follow, fully illustrated steps, automatically configuring the oscilloscope as well as the connected signal generator and network analyzer. R&S ScopeSuite also performs the measurements automatically, providing fast and unambiguous results, which are then documented fully in a test report. Individual tests or complete test groups can be selected based on the specific task. The software shows the test results with a red and green traffic light display. The user can summarize the results and optionally document each individual measurement in a test report with graphics and tables (Fig. 5). Fig. 5: Excerpt from a detailed test report. The University of New Hampshire InterOperability Laboratory (UNH-IOL) is recognized worldwide as test authority for compliance tests tools. 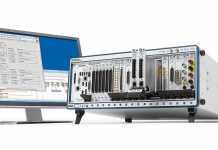 For this reason, Rohde & Schwarz asked the UNH-IOL to validate the R&S RTO oscilloscope and R&S ScopeSuite for Ethernet compliance testing and successfully passed these tests. Since then, UNH-IOL has been using the R&S RTO oscilloscope and R&S ScopeSuite test software.